MID'S Three Cheese sauce is a marriage of our classic meatless sauce and a unique blend of fine imported Parmesan, Romano and Asiago cheeses. 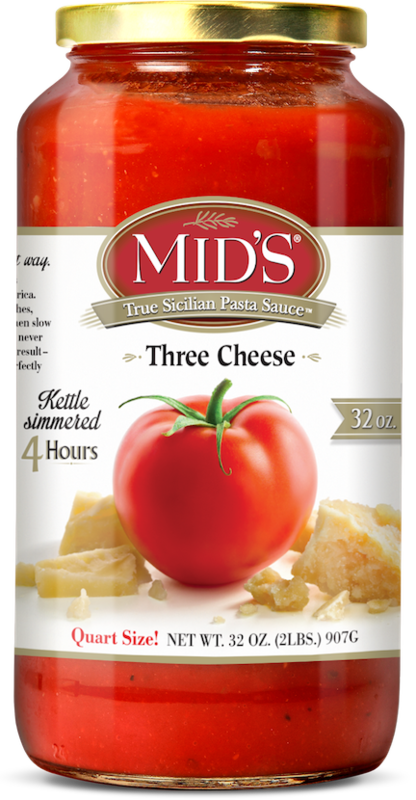 Handcrafted using all-natural ingredients like robust California tomatoes and spices from all over the world, Mid’s Three Cheese sauce has cheese lovers reveling in this distinct, gluten-free, aromatic blend of goodness. Try Three Cheese sauce with meatballs, on gnocchi or your favorite pasta. Or dazzle your family by adding some pizzazz to your chicken Parmesan recipe. Ingredients: Water, Tomato Paste, Sugar, Olive Oil, Parmesan Cheese (Made from Pasteurized Milk, Cultures, Enzymes, Salt), Salt, Onions, Romano Cheese (Made from 100% Pasteurized Sheep’s Milk, Bacterial Culture, Salt, Rennet), Asiago Cheese (Pasteurized Part Skim Milk, Cheese Cultures, Salt, Enzymes), Garlic, Spices, Citric Acid, Paprika.